Speakers have been part of every home since the 1960’s when bookshelf speakers were developed. Loudspeakers used to be very bulky, and the quality of the audio was positively correlated to their size. However, as technology progressed, researchers, such as Edgar Villchur and Henry Kloss, the founders of Acoustic Research and inventors of bookshelf speakers, were able to come up with good quality small speakers. Bookshelf speakers are characterized by being smaller than other commercially used or floor-standing speakers and are made of two boxes that produce stereo sound together. These are normally put on a raised surface and used along with televisions or home theater systems. Loudspeakers are categorized as transducers in electrical terms. They convert electrical signals to sound waves. The quality of bookshelf speakers is rated based on the range of amplitude and frequency they can produce or handle. Amplitude or loudness is the ability of speakers to increase the air pressure of the sound waves they have converted. On the other hand, the frequency is the ability of the speakers to handle the high or low pitch. Speakers that have the ability to convert higher (e.g. soprano voice) and lower pitch (e.g. bass guitar) are better than those with limited frequency. The Edifier R1700BT Bluetooth Bookshelf Speakers is considered as one of the most in-demand bookshelf speakers today because of its amplitude and frequency. Hence, in order to determine its quality, more details about the product have been given below. This bookshelf speaker comes with two speaker boxes with a remote control. Each speaker measures 254 mm in height, 154 mm in width, and 214 mm in depth. It has a wood finish that looks very stylish, and its colors match any kind of interior. It has two AUX inputs that can be connected to any device with a 3.5-mm jack or dual RCA. There is no need to switch plugs if there are only two devices to be used with the speakers. It also connects and pairs via Bluetooth technology with any phone, tablet, or laptop. That is because these speakers are compatible with iOS, MacOS, Android, and Windows. In addition, these speakers have Digital Signal Processing or DSP, and Dynamic Range Control (DRC) built-in to ensure that the sound is clear and free from distortions. Each of them has a 19-mm dome tweeter and a bass driver, which is four inches long to deliver a wide range of frequency. The bass reflex port is also in the front for a more powerful bass sound. The speakers can be placed 16 feet apart, as the cable that comes with the unit is that long. The package also contains an RCA-to-RCA cable and a 3.5-mm-to-RCA cable. It also has a remote control that can switch input sources, adjust the volume, and set the speakers to mute or unmute. They emit great sound waves. 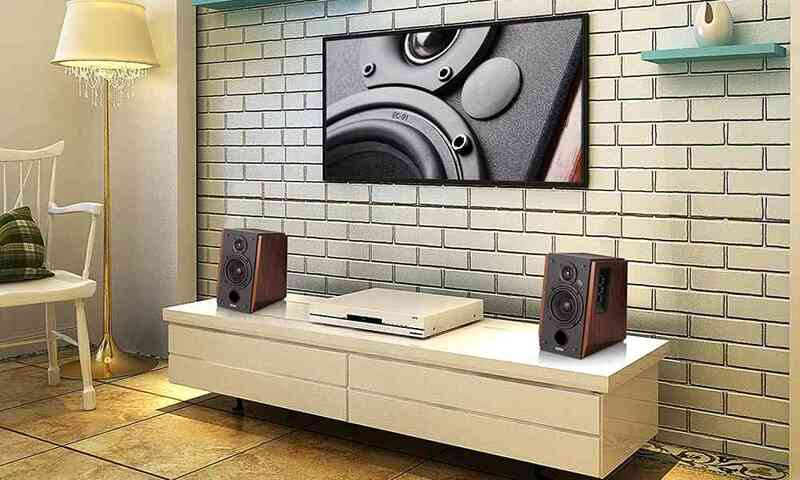 There is no need for subwoofers with these speakers since they create excellent high and low frequencies, and they can be heard in all the rooms of an apartment. The amplification of the sounds is first-rate as the DSP and DRC moderate the signals to avoid distortion of sound either wireless or wired. The fact that it also has a dome tweeter and bass driver of the right size makes all the sounds they emit pleasing to the ears. This can be used not only with the television, but also with gaming consoles, turntables, computers, and mobile phones, to mention a few. They look great in any room and equipment. The overall design of these speakers is sleek, and the colors are classy and eye-catching. The wood finish makes them look like they cost an arm and a leg. They are easy to place with any kind of device and would fit most racks and tables. It is also convenient to display the two speakers as they come with a long cable that attaches them. The package comes with all the essential cables and a remote control. Upon receiving the package, there is no need to buy cables and wires as these speakers come with everything one might need to set them up. Aside from the switches and knobs that are placed on the side for convenience, it also has a power LED light that changes from green to blue to let the user know what its input source is. It is blue when connected via Bluetooth, and green when using a wired connection. The remote control allows for changing the source and adjusting the volume from anywhere in the room. This model of Edifier does not have other settings such as optical input, and stereo-to-mono switch. Its remote control also does not have an option to change the equalizer settings. Edifier R1700BT Bluetooth Bookshelf Speakers is a decent product in terms of performance and looks. It produces good quality sound, look great with any device or with any home interior, comes with all cables and wires needed for setting up, and they are very convenient to use. However, they do not have optical input and switch to change from mono to stereo. 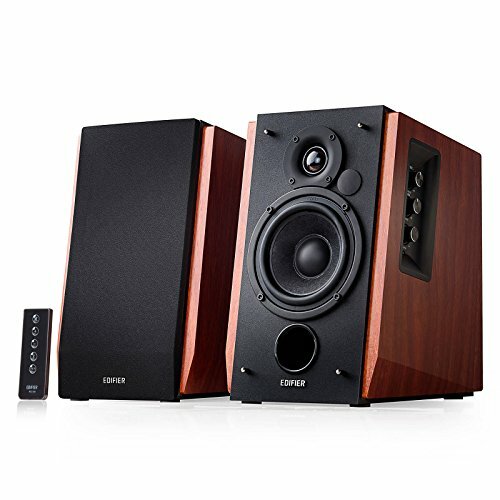 Compared to other equally popular brands such as Klipsch, these speakers are definitely better looking. The wood finish, complemented with the black exterior really makes them look first class. The quality of the sound produced cannot be compared as well as it does not even need subwoofers or passive speakers. The Edifier R1700BT Bluetooth Bookshelf Speakers gives a boom for the buck. It provides not only loud sounds but good-quality amplified sounds. Either wired or wireless, these speakers produce undistorted sound and uninterrupted listening pleasure.